Corsa Performance is best known for their exhaust system. Corsa X-pipes, resonator delete kits, cat-back, and axle-back exhausts are all designed for the performance-minded car enthusiast. Corsa axle-back and cat-back exhausts are manufactured from premium quality stainless steel tubing. The tubing are mandrel-bent to ensure better exhaust flow. Precision welds in the CNC muffler casing ensure zero leaks in the system. When choosing between Corsa axle-backs and cat-backs, you need to consider the set-up of your ride along with your budget. Axle-backs are more affordable and will work great for stock motors equipped with cold air intakes. This will give your high-performance car a deeper and louder exhaust sound while improving the throttle response and acceleration. If you want more sound and more performance, Corsa cat-back exhausts are the right choice. Cat-backs will replace the restrictive exhaust tubing in your ride to allow the engine to unleash more power and torque. This is great for tuned rides or for those who are serious about street performance. The only drawback is that cat-back exhausts are more expensive and will give your vehicle a louder and more aggressive exhaust sound. Corsa X-pipes are great for vehicles equipped with aftermarket headers. Corsa X-pipes offer better exhaust flow and can significantly lower the exhaust temperatures for better overall drivability. With Corsa mufflers and exhaust systems, you get what you pay for. Corsa offers the innovative RSC or Reflective Sound Cancellation Technology. This No-Drone Exhaust Technology eliminates resonant frequencies in the exhaust so you can cruise in silence despite the bigger exhaust pipes. See what Corsa Performance has to offer for your ride only here at Sam’s Motorsports. 2004-2008 Cadillac XLR Corsa Sport Series Exhaust Systems, The Corsa Sport Series Exhaust Systems is designed specifically to fit your 2004-2008 Cadillac XLR without any modification to your beloved Cadillac XLR. 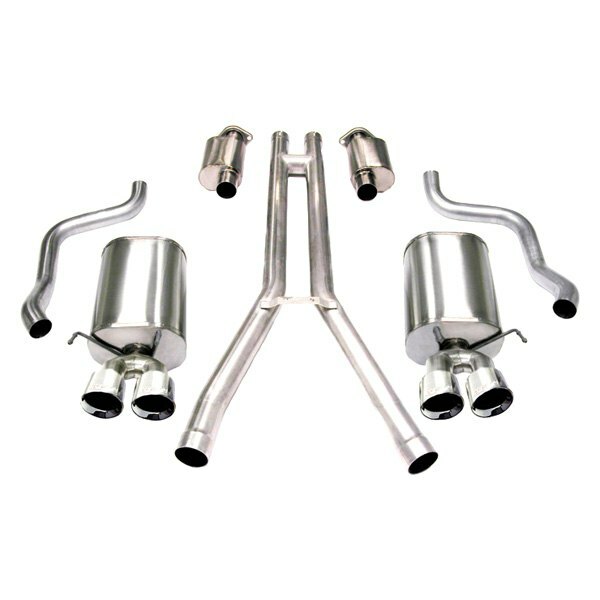 If this Corsa Sport Series Exhaust Systems is not exactly what you are looking for to accessories your 2004-2008 Cadillac XLR, please don't give up just yet. Our catalog has huge variety of parts and accessories for your Cadillac XLR.